Volunteers are needed the 2nd and 4th Wednesday of the month from March through October – 8:30 AM to 11AM. Volunteer opportunities are open to Master Gardeners and RR Tree Stewards. Directed volunteers are needed for pruning, weeding, general grooming and maintenance; contact Carol Groppell or Christine Tade for the garden’s current needs. Main Education/Training Tasks: Volunteers receive hands-on training and education about the care, maintenance and propagation of the plants and trees growing in this garden. Volunteers experience the joys and gratification of gardening even if they don’t have one of their own. In 2017, volunteers received hands-on experience locating and repairing the irrigation system. The garden is available for educational group tours and demonstrations. Restrictions or Special Requirements: There are uneven walking surfaces throughout the garden. In addition, the City of Rio Rancho does not allow smoking or alcoholic beverages in the Garden. The WaterWise Demonstration Garden (WWG) in Rio Rancho, New Mexico, is a cooperative effort of the City of Rio Rancho and the Sandoval County Master Gardeners, who also partner with the Rio Grande Basin Initiative, Rio Rancho Tree Steward Volunteers, local businesses and various community volunteers. The WaterWise Garden adjoins the Veterans Memorial Park and encompasses land which has been divided into multiple gardening zones to exemplify templates that are easy to replicate in the Southwest homeowner’s landscape. The Garden originated in 2001 through the visionary efforts of Tina Forgrave with award winning updates and expansions occurring in 2006 through 2008. 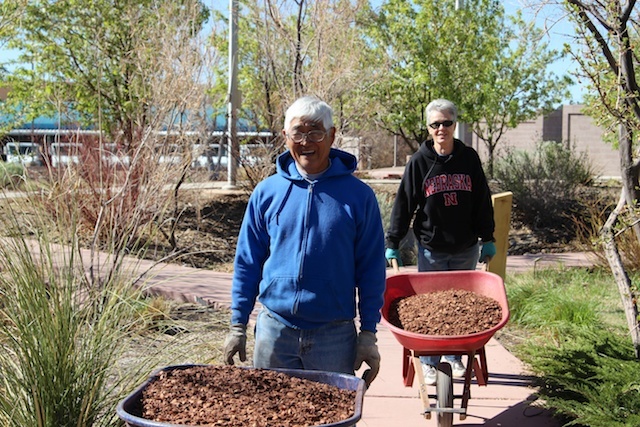 SCMG volunteers also began an Olla Garden Project in 2009 as part of a water-harvesting/water saving experiment with New Mexico State University and the City of Rio Rancho. The Rio Rancho WaterWise Demonstration Garden was awarded the 2009 International Master Gardener “Search For Excellence Award!” “Search for Excellence” is a program recognizing Master Gardener volunteer work throughout the United States and Canada. “Search for Excellence” has seven categories in which Master Gardeners can demonstrate their outstanding contributions to their communities. All SFE applications must show that significant learning took place, whether by the Master Gardeners or the general public they were involved with. All volunteer projects done by Master Gardeners are significant to their communities, but not all are “Search for Excellence” projects. The “Search for Excellence” is designed to recognize outstanding group projects, not an individual who does outstanding work.